This Is Our Brand New Wooden Wine Rack, Which Is A Dependable Organizer For Storing Your Favorite Wine Bottles. Made With Compactness And Beauty In Mind, This Wine Rack Is Equipped With 3 Slanting Tiers, 2 Vertical Rows On Both Sides. It Can Offer You A Total Storage Of 34 Bottles. There Is A Storage Shelf On The Top And 4 Grooves For Goblets. 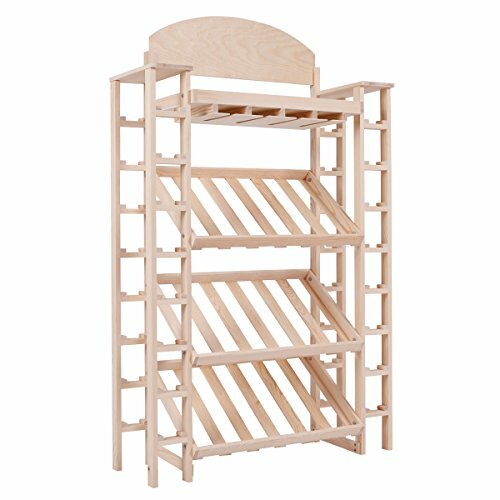 Made Of Natural Pine Wood, This Wine Rack Is Sturdy, Durable And It Is Easy To Assemble. Don't Hesitate To Add It To Your Cart! Size Of Each Slanting Tier: 23.4"L X 14.1", Distance Of Slanting Tiers: 11.8"
View More In Bars & Wine Cabinets.